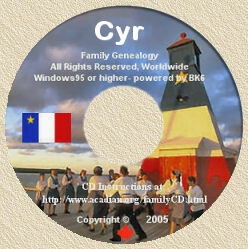 Acadian Genealogy Homepage; "Cajun-French"...or is it "Acadian-French"? Ici nous parlons "Cajun-French"...or is it "Acadian-French"? For seven days this past summer (1996), Marie-Forest Broussard and Dana David travelled between Richibucto and Cap Pele New Brunswick, tape recorders and notepads in hand. The two are graduate students from the University of South Louisiana (USL) in Lafayette, LA and they were in New Brunswick to listen, and listen closely! "We went to find Acadians to talk with and take these interviews back and eventually make comparisons between Cajun-French spoken in Louisiana and Acadian-French that's spoken in New Brunswick, to find the differences and similarities." said Ms. David. What the two were doing, was "a linguistic analysis, a study of the the dialects and the language, more than the people," added Ms. Broussard. They wanted to know what was kept in New Brunswick, what was transfered to Louisiana and what's been lost in Louisiana. For example, there are still nautical terms used in Louisiana, but they've been adapted to the environment; "there's been a glissement de sens," said Ms. David. "My grandmother uses the term une chaise a secarguer as a term for a Lazy-Boy chair. Secarguer was a term used on a boat, indicating the use of ropes to trim the sails. It means to slant something. It's been transfered to a chair! There's been a glissement de sens that really hasn't been looked at from our end of it," she said. Their visit, the first of its kind for this type of study, was part of a $15,000. five-year grant to compare language between "les Acadiens du nord" and "les Cadiens du sud". "Not much work has been done on Cajun-French at all. There's a richness to this French, that's been overlooked," said Ms. David. "What's wonderful is that in New Brunswick you can live in French, whereas in Louisiana you still have a stigma about the French that's spoken there. People of my mother's generation, in their 50's and 60's, still have a stigma about Cajun-French, que ce n'est pas le bon francais". The sting of that stigma has been relieved, especially since the founding of the Council for the Development of French in Louisiana (CODOFIL), almost 30 years ago. The state agency initially brought in teachers from France, Belgium and Canada to teach standard French. "That didn't work because kids would go home and their grandparents didn't understand them," said Ms. David. Now immersion programs are becoming more popular. "Hopefully we can implement a Cajun vocabulary and grammar. The next step is to analyze the language, valorize it and use it," she added. Ms. Broussard credits CODOFIL for bringing the changes about that were necessary. "CODOFIL did a tremendous amount to initiate interest in French. The French language had pretty well gone in Louisiana. It was the language of the diplomats and I was instructed in French, because it was the socially acceptable thing to do, but it wasn't because of your heritage. Now the realization of the importance of heritage has been brought to the forefront, I feel from CODOFIL". The two are perfect examples of the change in attitude towards all things French and Cajun in Louisiana. Ms. David grew up hearing French spoken by her grandmother, ("she still does NOT speak much English"), understanding some French and with a thirst for more. She won a scholarship to study French in Belgium, worked as a flight attendant, but something...her Cajun past or the tug of history...kept pulling her back. "I said 'Wait, I've got to keep doing this' ", so she did her masters degree and started work in francophone studies. Ms. Broussard grew up in New Orleans, but her mother was born in Gueydan, in the heart of Cajun country. She studied French in school but couldn't speak the language, until she studied in Switzerland for two years. "The way I see it, is that somehow this work will maybe help valorise the French that we speak in Louisiana. If we have a chance to get French going again, we have to look at it, a little differently and say, 'Okay, it's not standard French, but it's French and it's just as good as French from France", said Ms. David. Both inside and outside the state, there's been an ever-increasing awareness of Cajuns, their history, their culture and their language. (The next Acadian World Congres in 1999, will be held in Louisiana). All of south Louisiana was pioneered by the French, whether thay came via Acadie or straight from France and the French influence in Louisiana is what we are", added Ms. Broussard. The above noted is re-printed, with thanks, from the July 25, 1996 issue of the New Brunswick Telegraph-Journal Newspaper.